Educational Technology Guy: Own a smartphone? Here's were you can find some great info and help. Own a smartphone? Here's were you can find some great info and help. 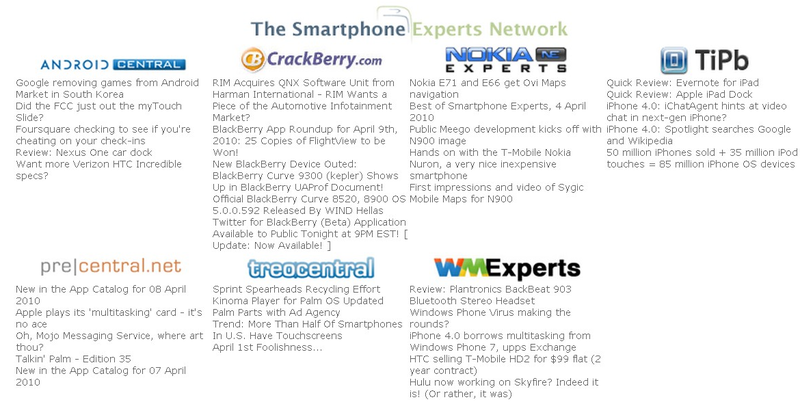 The Smartphone Experts network is a network of web sites about each of the different types of smart phones. The sites have news articles, reviews, tips, discussions, and more about each one. If you have a smartphone, you should check out the site for your phone and subscribe to the feeds. The tips, tricks, and info that I have learned is great. You can also find solutions to issues or problems you may have. Android Central - for Google Android phones, like the T-Mobile G1, Droid, HTC and more. WM Experts - for phones running Windows Mobile, like the Palm Treo Pro and HTC phones. These sites are great resources for smartphone owners.